This personal biography covers my background through my education at Yale and MIT. My professional life as an economist is covered in my vitae (or short bio if you prefer), and on my research interests page. I grew up in Rochester, New York (near Buffalo and Niagara Falls in upstate New York). My father, Stanley M. Rogoff, was a Professor of Radiology at the University of Rochester, one of the first medical schools to realize that doctors need to learn basic science if they are to keep up with medical advances over their lifetimes. He served as Chairman of the Radiology Department at Strong Memorial Hospital and as President of the American Society of Diagnostic Radiologists. My mother was (coincidentally?) a social science librarian and later became head of the main branch of the Rochester public library. My older brother Hal inherited my mother’s broad intellectual curiosity. I, myself, liked playing basketball, baseball and football with my friends. As true liberals, my parents insisted on living in the city where their children could have a genuine American inner city high school experience, which we certainly did. Given that a healthy majority of my East High School class did not attend college, much less graduate, it is an amazing coincidence that two members of Harvard’s Department of Economics attended East High (albeit at different times), myself and Andrei Shleifer (winner of the 1999 John Bates Clark award as the top American Economist under 40). I learned the moves from my father at age 6, but took up the game in earnest when I got a chess set for my 13th birthday. Although the epicenter of United States Chess has always been New York City, Rochester has a very good club that boasted a many-time New York State champion, Dr. Erich Marchand. There is no such thing as a pure prodigy in chess, and I worked very hard at it. By age 14, I was a U.S. master and New York State Open champion, and shortly thereafter became a senior master, the highest US national title. By 16, I was U.S. under-21 champion and representing the United States in the World championships in Stockholm (picture). It was at this time that I first got to know the brilliant American player Bobby Fischer, who was shortly to become world champion, and is widely considered to be one of the couple greatest players of all time. Fischer actually wrote an article about one of my games from the 1969 US junior championship, one of the very few times he ever chose to write about someone else’s games. (Here is the article, from the 1969 issue of Boys Life.) Though it is not particularly a record chess players strive for or care about, my marathon game (from Stockholm 1969) against Britain’s Arthur Williams established a new record for the longest game ever played and was featured in the Guinness Book of World Records from 1971-73. At that point, I decided to miss most of the last two years of high school, and move to Europe, which at the time had many more tournaments. I lived on my own, mainly in Yugoslavia (Zagrab and Sarajevo), supporting myself with my prize winnings. 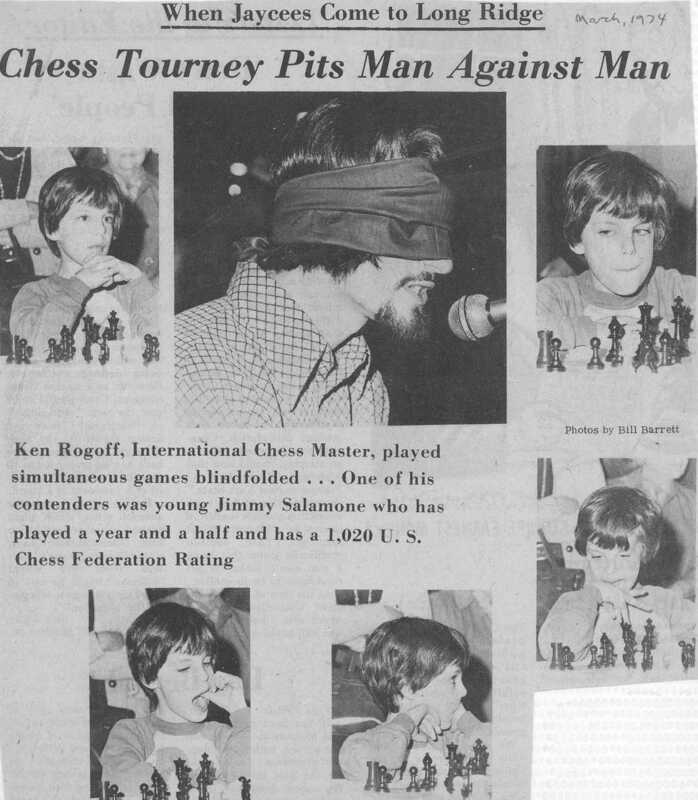 I supplemented my income by giving simultaneous exhibitions (where a master typically plays anywhere from 25-75 club players at the same time) and blindfold exhibitions (pictured), in which a master plays a smaller number of players (say 6-12) without any sight of the boards (my personal record was 26, in Rochester NY at age 15). 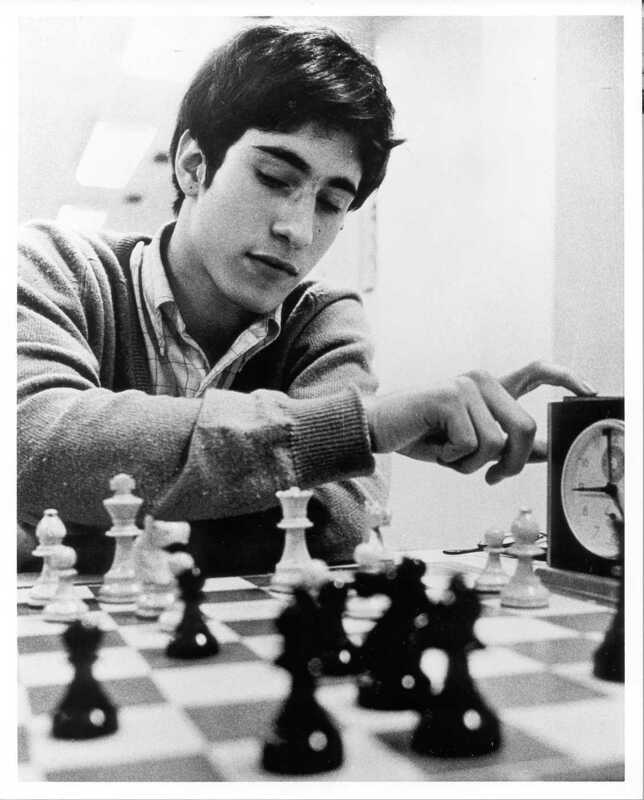 At 17, I played first board for the US team which won the world championship in Haifa, Israel (the world champion US team). I do not know what possessed me, but at age 18, I decided to completely buck the trend among my chess peers and apply to college. Happily, Yale University decided to ignore the many holes in my high school transcript, and admitted me to the class of 1975. 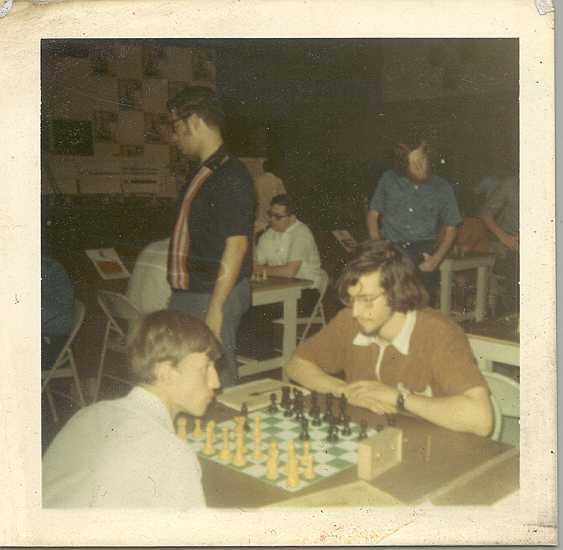 Here I am as an 18-year old freshman at Yale against 20-year old Anatoly Karpov of the Soviet Union in the World Under 27 team championship in Mayaguez, Puerto Rico. (At this time, Karpov was on the cusp of his decade-long run as world chess champion, before eventually losing his title in a series of extremely closely contested matches with Garry Kasparov.) 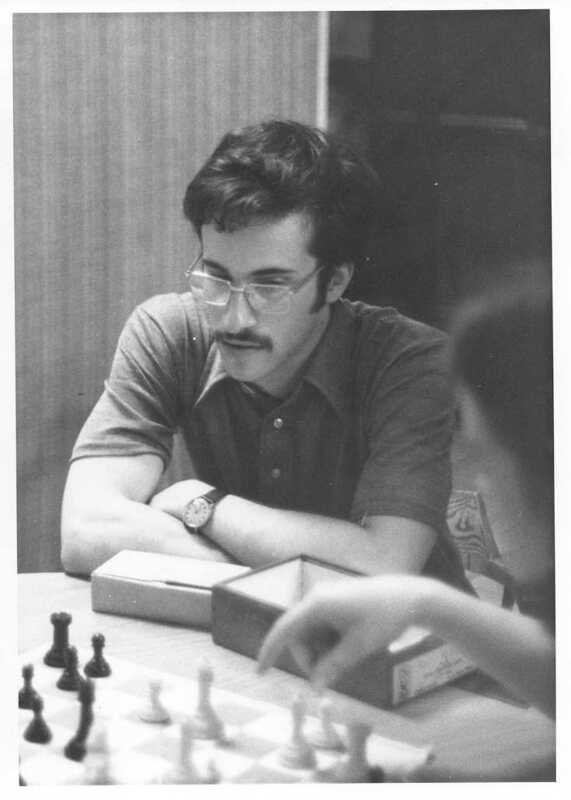 My game against Scotland’s David Levy (who was later to become one of the pioneers of computer chess) is featured in American Chess Masters From Morphy to Fischer by Arthur Bisguier and Andrew Solitis (MacMillan, 1974). At Yale, I played chess only in the summers, mainly living off ideas I had developed in high school. Through maturity, I guess, I continued to improve, finishing 5th, 2nd and 7th in three US Championships I played in, tournaments where (more or less) all the other players were full-time professionals. I eventually went on to represent the United States at the World Championship Interzonals in 1976. (Courtesy of Sports Illustrated, which featured the 1975 US championship in Oberlin, here I am at age 22.) I was the youngest player, finishing tied for 13th-15th. I became an International Master in 1974, and in 1978 I was finally awarded the title of International Grandmaster, the highest title in chess. (It is a life title; at the time, there were just over a hundred grandmasters in the world.) Back then, computer chess was in its infancy, but as MIT graduate student I had the privilege of playing a number of games against legendary hacker Richard Greenblatt’s chess program, which had already reached the level of a strong club player. As I write here, although I was able to beat it consistently, it was still a sobering glimpse into the future. Because of conflicts with my studies, I ended up playing just over 300 tournament games lifetime, an unusually small number at the professional level where 100 – 150 games per year is the norm. Of these 300+ games, some 25 were featured in the weekly chess column of the New York Times during the period 1967-78. Here are some of them (there were losses too, but you will have to look at the microfilms on your own if you really want to see them). On the personal side, here is an article I wrote for Seventeen magazine, explaining a bit about the life of a chess player. Even today, every once in awhile, my games are reprised in a chess magazine or newspaper. Here, for example, is a September 28, 2008, New York Times article, a March 2010 Chess Life article, and a February 2011 Financial Times article. And, of course, there are still articles that touch on my chess career without getting into actual games, for example The New York Times, July 4, 2010. For a more extensive interview on chess and a couple selected games see New in Chess, January 2011 (pdf). See also BBC World News "Economics and Chess", December 15, 2011, Chessbase "Ken Rogoff on Chess Addiction", December 15, 2011, and CNN Your Bottom Line "Solving the Financial Crisis: A Game of Chess", August 18, 2012. In August 2012, I played a very casual exhibition rapid game against the world's highest-rated player, Magnus Carlsen of Norway. This game very temporarily ended a three-decade hiatus from playing any kind of chess. Here is an article (pdf) containing leading chess columnist grandmaster Lubosh Kavelek's notes. The game also featured in the Sunday October 14 New York Times Chess column by Dylan McClain (pdf). I never met the great world champion Gary Kasparov on the chessboard, as my relatively brief career ended just as he was emerging. However, we did have a spirited debate at Oxford University on November 9, 2012, on whether technological stagnation is at the root of the post-2007 growth. My own views are summarized in my December 12 Project Syndicate column Innovation Crisis or Financial Crisis? And here is my take on the 2015 Hollywood film, "Pawn Sacrifice," on the life of Bobby Fischer, directed by Edward Zwick and starring Tobey Maguire. The Zwick film, of course, centers on the classic 1972 World Chess Championship between Fischer and Russian Boris Spassky. 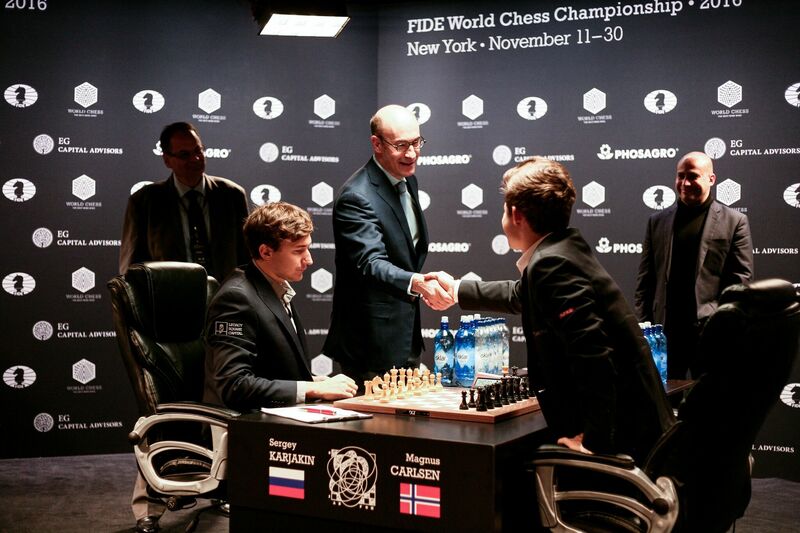 In 2016, I had the honor of making the first move in game six of the world championship match between Norwegian Magnus Carlsen and Russian Sergey Karjakin, and I also did commentary in game 1 with Judith Polgar. Here is a January 2017 column for Chess Life magazine, My Best Move, where I chose a game from first board of the 1972 world under-26 team championship in Graz, Austria, where my opponent was then leading Russian grandmaster Vladimir Tukmakov, who is still very much involved with chess and very recently has started working with rising superstar Wesley So. For some of my reflections on the state of chess today, see the March 23, 2018 Chessbase interview and December 4, 2018 CNBC Squawkbox. At Yale, I became a student of (later Nobel prize winner) James Tobin. My classmates included (now Stanford professor) Jeremy Bulow (who had a huge influence on my decision to go into economics), and (now Yale professor) John Geanakoplos, both of whom were later to be roommates of mine in graduate school. Jeremy and I went to MIT graduate school, John went to Harvard, John had more fun. 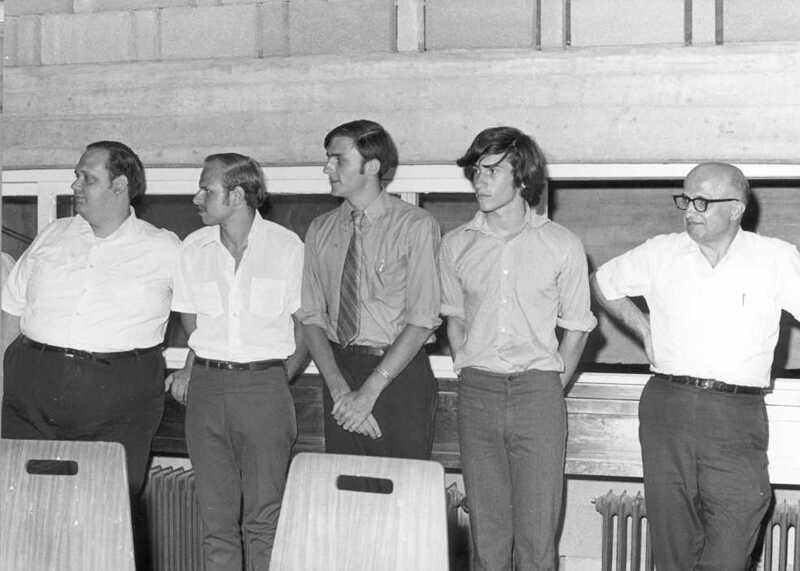 My thesis committee consisted of Rudi Dornbusch (main advisor), Stanley Fischer and Jerry Hausman. Jagdish Bhagwati, the distinguished trade economist now at Columbia, was also an important influence. I must admit that I was not the best student in graduate school since, at the time, I was still torn between being a professional chess player and a serious research economist. Indeed, I ended up repeating my East High School experience, and dropped out after a semester, but this time I ended up deciding to re-enter a year later. I am fortunate that MIT was very accommodating about all this.